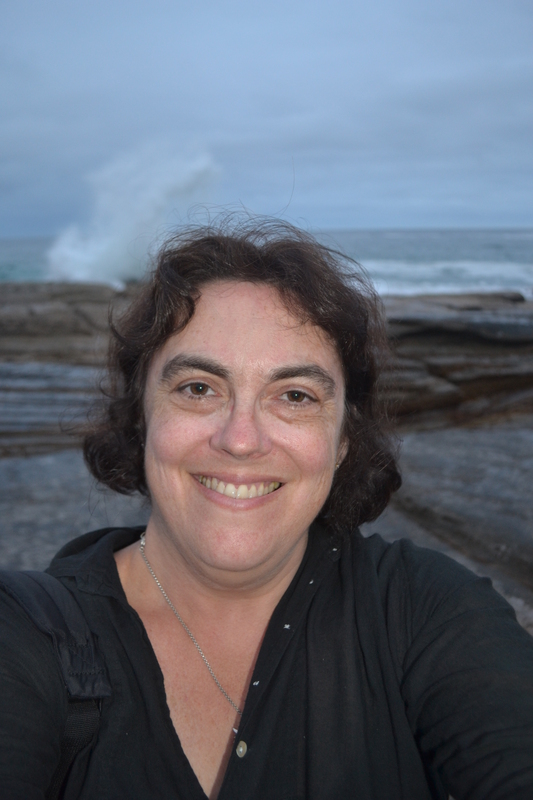 Here I am sitting on the rocks at Whale Beach watching the waves literally explode as they smack against the rocks. It is hard to describe their incredible force, bursting like fireworks and then cascading through the cracked and creviced rock platform down below and returning back to the sea. Multitasking out here is absolutely impossible. It’s a case of either write or take photos. I can’t do both. Damn! The frustrations of an imperfect world! So let me rewind just a little and look through the lens instead of the pen. The waves are taunting and teasing me. Luring me close with their smashing, violent force only to recede and disappear and fade into a gentle rolling lull. Talk about utter frustration! Not that these efforts were ever going to be about achieving the perfect shot…getting the big one! The light’s all wrong. It is almost dark and this is a time of low light and shadows. These photography efforts are more a case of just trying the capture the moment as it is and I guess with a hope of coming back at a better time. I’d also like to “play it again Sam”. I was mesmerised by it all. Not just the visuals but also the symphony of sound as the waves beat and whooshed around the rocks and into the cavernous depths below. I would love to share this experience with the world even in its imperfection because it was just so powerfully beautiful and moving. Moreover, the turbulence of the waves somehow reflected some of my inner unrest and the knowledge that I have a hell of a fight on my hands. My journey is currently very intense. Trying to photograph the waves reminds me of surfing…not that I’ve had a lot of experience on the front. Aside from getting the light right and choosing a good subject, timing is critical. You have to press the button at precisely the right moment or ideally just that microsecond beforehand to compensate for that barely perceptible time lag between the subject and the lens. Timing has never been my strength. In fact, today I wouldn’t even say I ran late. I went AWOL…off the grid…beyond time. Bought myself another watch and I’m hoping that will help. Ro without a watch doesn’t stand a chance!! In the end, I found myself trying to read the waves to better predict the big ones in advance. While this all sounds like I know what I’m doing, I’d probably have better luck trying to read its palm. I’m no seasoned surfer who lives and breathes with the waves. I can’t even spot a rip. Moreover, although I’ve been spending a lot of time at my parents’ place on the Pittwater side, that’s flat water. There’s barely a ripple. Yet, while I mightn’t be kind of enlightened wave-watching expert and interpreter, that didn’t stop me from trying. Even though the light wasn’t anywhere near perfect, I still wanted that shot. Every single muscle and cell is primed and on red alert and I was poised on the rocks with my camera in position like that stalking, lurking cat about to pounce on a mouse. I’m watching waiting, observing all those very subtle signs as the water surface curves and tightens but then swells and falls. Of course, the big one doesn’t come while I’m fixated, camera poised. I wait and wait and wait. As I said, photographing the waves is like surfing. Surfers seemingly sit on their boards for eternity waiting for the big one to come and now I was doing the same! Waiting is also a big part of photography…huge! The waves go quiet. There’s absolutely no action whatsoever so I decide to swap my camera for my notebook and pen. In this instance, my notebook is made of paper. It’s pad not a computer. Of course, now that I’m writing and I’ve packed up my camera, a huge, ginormous waves smashes against the rocks and water shoots up like lava from an exploding volcano. Whoosh! I am in such awe of its raw, unbridled energy and power. I have always loved watching the waves feeling that all that energy somehow mirrors the raw, turbulent energy thrashing around in my soul. I’ve never been one of those chilled out peaceful types. Definitely, a woman of passion! Wave hits just as I’m taking a selfie. Many years ago, I spent hours sitting on these same rocks when my parents had a place across the road from the beach. Back then, I also photographed the waves somehow trying to freeze all that energy and power in 6 x 4. I had a favourite spot… my rock…where I used to contemplate and photograph life, the universe and everything. Indeed it was on this rock that I met a special friend and I was visiting her this afternoon for a healing massage, a chat and very much a merging of souls. She has the most amazing kindness and is such a giver. Such an amazing giver and at this point, I have just absorbed her great kindness as a healing gift. She even gave me a sunflower plant not knowing that I’d written about being the seed a few days ago. Not knowing that I am intending to give my children a sunflower seed so they can think about how they are going to grow and develop this year in themselves (that was in response to astronaut Chris Hadfield’s comments mentioned in a previous post). We are also going to plant some sunflowers and watch them grow. Sunflowers have always been my flower and I’d also written a poem called Sunflower back in my 20s that was one of my signature poems. My friend knew nothing about all these sunflower connections when she gave me the plant. It was so very obviously mean to be. After this fairly amazing time with her, I just felt drawn to go back to the rock where we’d met and complete the process. That’s what took me back to Whale Beach. After the crash, the waves flow over the rocks like spillt milk. Anyway, as I said, I have spent many, many hours sitting on these rocks. Back in 1997, I at on these rocks while recovering from brain surgery wondering when but more likely if I would ever get better. It really looked doubtful that I would ever get my old life back again. The road back to so-called “normal” was just way too steep…an insurmountable climb! All the quirks and idiosyncrasies of my hydrocephalus haven’t left me entirely but they have virtually disappeared and I can usually compensate for my remaining weaknesses. This gives me much hope that we will contain and manage this lung disease and that I will heal…at least enough! It is a huge leap of faith and very, very scary for me to step out and put my hand out and say: “Please God, heal my lungs and save my life.” Yet, God is my father. He loves me. At the same time, I know that he doesn’t always intervene and we all have to die one day. You could say this is a bit of an aside and yet it’s not. While I’ve been savouring the absolute beauty here, I’ve also been stepping over cigarette butts stubbed out against the rocks and left behind. It is so hard for me to comprehend how anybody could light one of those cancer sticks consciously and actively destroying the very same lungs I’m fighting tooth and nail to save. These same morons are also littering the environment. I put down my pen and return to my camera opting to film the wave instead. As much as you want to freeze the wave in 6 x 4, a wave is a living, breathing, and above all else moving experience. It’s not static. It’s like picking a wildflower and sticking it in a vase. You’ve destroyed what it is. Its spirit has gone. A wave doesn’t sit still. It was low tide and I took the dog down onto the mudflats for a walk. After being so absorbed in the turbulent even aggressive surf at Whale Beach, Pittwater was so completely serene almost standing still with just the smallest of ripples caressing the surface. It was so peaceful. I couldn’t help but notice the contrast between the two. Pittwater reminded me of a Bible passage I have struggled with for many, many years: “Be still and know that I am God” while at Whale Beach I could hear Christ’s impassioned plea from the cross: “My God! My God! Why have you forsaken me?” Pittwater is only round the corner from Whale Beach symbolic perhaps that peace is only round the corner when we’re feeling all consumed by troubled times. Relief isn’t far away. 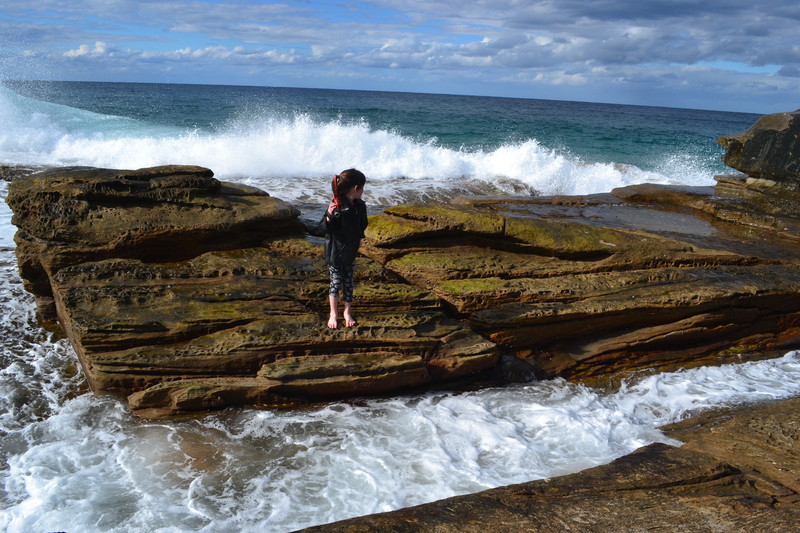 This entry was posted in Health, Photography, Sydney Postcards, Travel, Uncategorized and tagged auto-immune disease, beach, chemotherapy, Christianity, chronic illness, God, healing, Jesus, lungs, photography, prayer, rocks, waves, Whale Beach, writing on January 21, 2014 by Rowena. Have you ever had an experience where your feet somehow walk ahead of you? That you suddenly wake up and you don’t know how you’ve got there? That something which has slowly been percolating away at the back of your mind has suddenly jumped out in front of you like a kangaroo in the headlights and bam. You’ve suddenly hit your dream head-on and almost had a fatality. You’re in shock. You just can’t believe how all your ducks have suddenly lined up all at the same time. How is this so? It doesn’t make any sense. It doesn’t make any more sense that when bad things happen to good people. There are just mysteries in this life…questions which are never going to be answered. Coincidence is one of these great mysteries. For the last few weeks, I have been working pretty flat out on my poem The Surfer’s Dog. This poem was inspired by a dog I saw at Whale Beach in Sydney something like 20 years ago. I photographed this particular dog lying on the beach staring out to sea watching his master. He seemed to be waiting and waiting for hours just lying there in the sun. He didn’t go to sleep or move a muscle. He just lay there waiting patiently for his master to return. He had such loyalty, devotion. His master was his entire world. 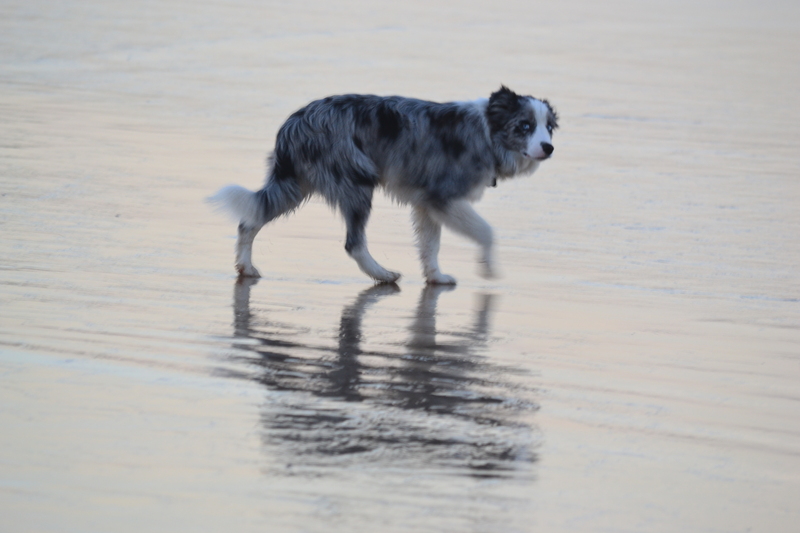 I remember ebullient excitement when his master eventually emerged from the surf and then they walked along the beach together back to the car. The dog was in heaven. That dog has stayed with me. He was the epitome of loyalty, devotion and love and yet I wouldn’t advocate putting your life on hold like that or revolving your life around someone else either. Phrases like “get a life” come to mind. He was an adorable but quite a lone figure on the beach…almost like a ghost…as he waited for his master to come back. The Surfer’s Dog…hardly a glamorous breed but tough. Surfer’s dogs have always seemed a breed of their own…rough and tough and certainly not at all fluffy. Perhaps, they might have a touch of kelpie or working dog but certainly nothing glamorous. I’ve certainly never seen a surfer with a fluffy, white dog like the one in the My Dog commercial. Last October, I went back to Whale Beach for the first time in about ten years. It was a strange experience because in so many ways, time had stood still. Nothing much had changed. In particular, I noticed that the surfers were still out there in the surf bobbing up and down like seals and it just seemed like they have always been there. They’ve never left. They were caught up in some kind of time warp. It was like they weren’t real…more iconic. That inspired my poem: Surfing Through the Hourglass, which is still a work in progress but I’ve posted it as part of this story. In the original version of the poem, the surfer’s dog was more of an image…an icon rather than being a real dog. The dog has been there so long that he’s become part of the spirit of the place. Then I came up with a stanza about who feeds the dog. How does it eat? I mentioned that to Geoff and he said that if there was a dog on the beach people would be feeding it. As a result, the surfer’s dog became more of a community dog. I thought about him being a bit like a barperson who listens to everyone’s problems…a friend to all and yet at the same time, the surfer’s dog only has one master. At this point, I was pretty sure that I’d finished the poem but I took it in with me for a final proof when I was having my regular blood transfusion of Immunoglobulin. These transfusions take about 4 hours so it’s a great time for me to write and catch up on some reading. Well, The Surfer’s Dog took another U-Turn. Instead of just passively waiting for his master to return, he was now wanting to learn how to surf. However, because he’s never seen a dog surfing before, he chickens out. He’s afraid. Doesn’t want to make a fool of himself. He has his pride. He is the surfer’s dog. By the time I’d reached this stage of the poem, I was living and breathing The Surfer’s Dog. I was editing and re-editing the poem for hours each day and the surfer’s dog was my constant companion. Then about a week ago, I had another revelation about the poem. I was the surfer’s dog. I have desperately wanted to learn how to surf most of my life. To me, surfing has always been the epitome of freedom and that sort of merges with my dream of taking off in a kombi. I realise now that my mythical Kombi has always had a surfboard strapped onto the roof and we’re heading up to Byron Bay. I can already feel my hair blowing in the wind,the sand between my toes and the waves calling me. I’ve always wanted to learn how to surf but I’ve only been surfing once about 20 years ago and I’ve never forgotten just how amazing that felt. A friend of mine had come down to my parents’ beach house at Whale Beach and had brought his board along. I only went on it once. I didn’t stand up. I just lay on it and caught my first wave….my one and only wave. I still remember how good that felt…the exhilaration, the power of the wave. It was just amazing!! I could have surfed for the rest of my life. Yet, for some strange reason, I never went surfing again. The surfboard rider and I were supposedly “just good friends” and we all know what that means so there were no more surfing lessons from him. We lived just across the road from a legendary surfing beach and yet we had no surfboards. It all seems a bit insane now. After all, what is a beach house for???? So there I was a week ago having spent hours and hours and hours living and breathing as the surfer’s dog sitting on the beach inside his scruffy, sand-encrusted coat when I realised that I desperately wanted to surf. That I’d always desperately wanted to surf and here I was 43 years old and 20 plus years later and I’d done nothing whatsoever about it. The eyes of my heart had been opened. The scales had been lifted and I could finally see things clearly. 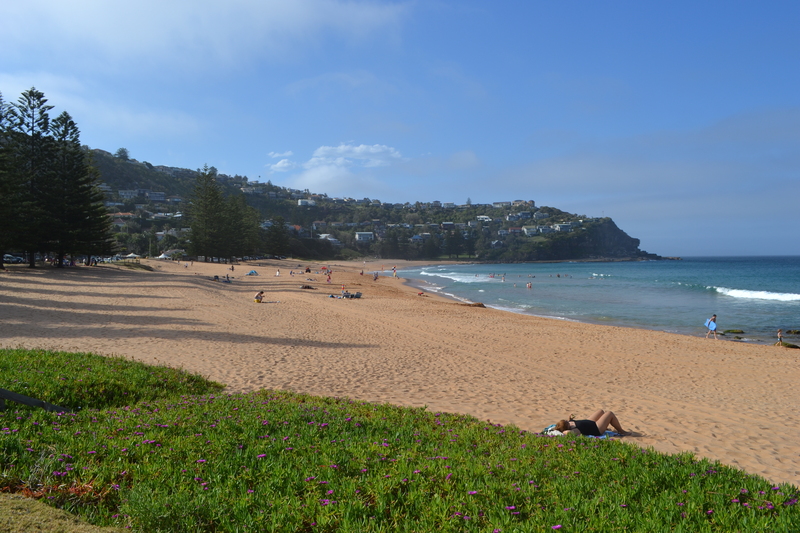 I had to learn how to surf…especially as I only live 700 metres from the beach now. I’ve been living here for 11 years and I haven’t even tried out the kids’ boogie boards. It really does paint me as a bit of a sod. It was time to get moving! The morning after this great revelation, I left for an Adventure Camp at Nelson Bay with Muscular Dystrophy NSW. They support me with my auto-immune disease as it affects my muscles. We were just settling into camp when I looked at the program. What was the first thing on the program…learn to surf! I couldn’t believe it! It’s taken me more than 20 years to realise just how much I wanted to surf and then hey presto I’m going to surfing lessons the very next morning. I was so stoked but I was also gobsmacked. My dream had been hand-delivered to me on a silver platter. I couldn’t believe it!! It was all a bit surreal and too much of a coincidence. I was going surfing. Me… the middle-aged mother with the dodgy muscles was actually going surfing! It was so bizarre especially after working on that poem so intensely. I was reminded of a quote by Oscar Wilde: Life imitates Art far more than Art imitates Life. Yet, before I experienced the exhilaration of actually surfing, I still needed to clear a few minor, major hurdles. Firstly, I had to squeeze into my wet suit. These things might look fabulous on a very fit, young body but I had serious trouble getting into mine. They seem to be two sizes too small and it’s pretty tricky squeezing all this whale blubber into such a confined space. My balance isn’t the best so I also needed a bit of assistance to climb in and it really did feel like I was climbing inside some kind of very thick and inflexible second skin. This was when I found out why surfers strut. Wet suits are so stiff, you’re moving like a robot! Sadly, even in my tight, constricting wet suit, I didn’t perfect the strut. I was still me. The second thing they leave out of the surfing brochures is just how much a surfboard weighs and you can’t just stick them on a luggage trolley and pull them down the beach. No, to be a true blue ultra cool surfie dude, you need to have your surfboard casually tucked under your arm like a piece of cardboard. Ha! Surfboards are heavy. I guess that’s how surfers develop all those lovely, well-developed muscles. My muscles don’t work that well so I had to settle for assistance. One of the carers very kindly carried my board down to the beach. Once there, I lugged the thing awkwardly by the neck while the poor tail dragged along through the sand. I had no poise or grace whatsoever…and certainly no strut! But so what if I didn’t look cool?!! I didn’t care! I was too blissed out living my dream to care about the mechanics. I just wanted to surf! The surfer’s dog was finally going to catch a wave. Wait! Before we actually hit the surf, we had a surfing lesson on the sand. This lesson just took us through the basics of surfing like the parts of the board and attaching the leg rope to your stronger leg. I took special note of the leg rope and was determined not to trip over it!! Wow! I caught a few waves. It was awesome. Then it was time to really get stuck into it. We were back out on the sand learning how to stand up. This was getting serious. Could I do it? Could I actually stand up? I wasn’t holding my breath although it would have been out of this world to pull it off and rather amusing. 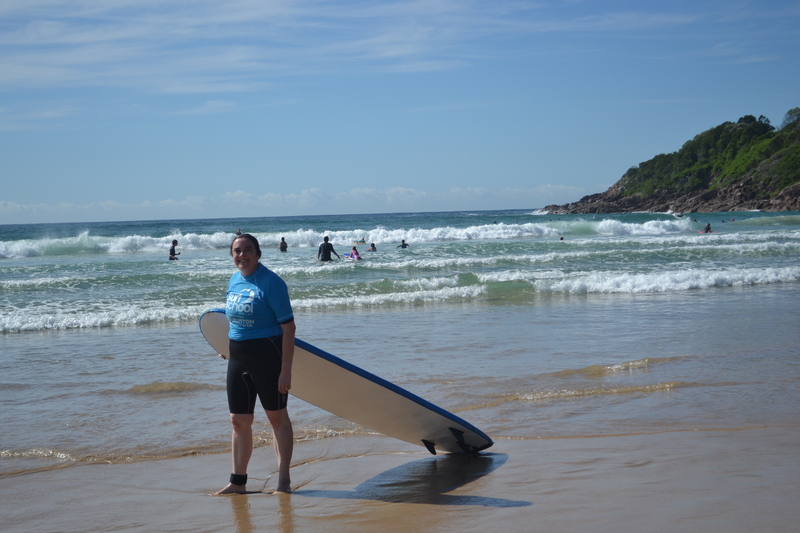 Mummy learning to surf at my age…ha! Standing up was proving seriously difficult. As I mentioned before, I have muscle weakness. Moving from sitting to standing isn’t a quick, seamless manoeuvre on land. It takes time, thought, effort. The instructor was quite encouraging suggesting that the water might help to lubricate the board and make it easier but I wasn’t convinced. I had a go in the surf and nothing budged. But the instructor wasn’t to be deterred. I started off in a kneel and then tried to manoeuvre my feet to get me up but they wouldn’t move either. My movements were just too slow and awkward. I’d need a good hour to laboriously move all my body parts into the right positions and by then the wave would be history. Standing up wasn’t going to happen at camp but I didn’t dismiss it as a never ever. I might just need a bit of practice. As much as you need to push yourself to reach a dream, you also need to know when to stop and defer things to another day. Surfing was hard work and had what Beatrix Potter would describe as a soporific effect. I went back to our cabin for a snooze. Instead of waking up feeling like an iron woman the next morning, I felt like quite the geriatric. Almost every muscle ached but it was worth it!!! Rowie had finally caught some waves. Wahoo! I was finally surfing my dream. Now, perhaps there’s even hope for the surfer’s dog! 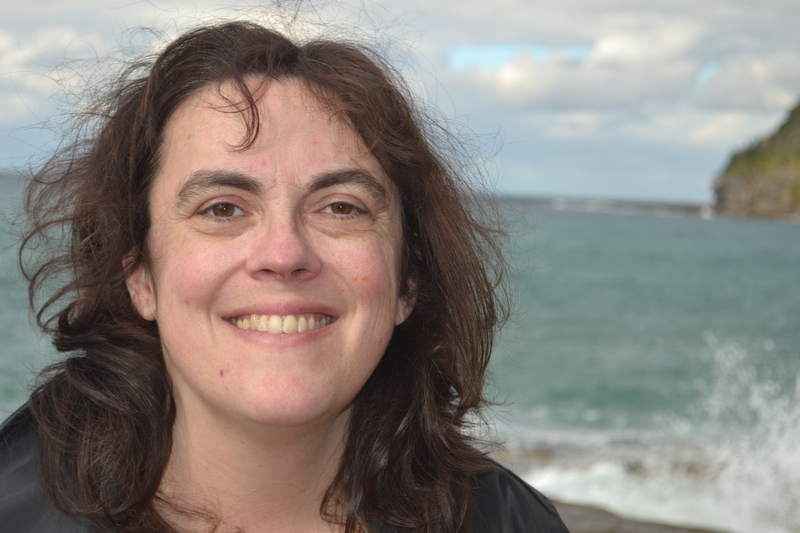 This entry was posted in Poetry, Travel, Uncategorized and tagged beach, chronic illness, dermatomyositis, dogs, goals, healing, motivation, mum, Muscular Dystrophy, Nelson Bay, surfing, Whale Beach on April 20, 2013 by Rowena. Meant to Be… Whale Beach Revisited. Recently, I had the strangest experience. One of those freaky coincidence experiences that really makes you wonder how the universe operates and how these seemingly unrelated cogs suddenly end up whirling together in unison. Whether you believe in God or not is almost irrelevant because it’s hard to believe that God who operates on such a grand scale such as creating the universe, would have time to be bothered with the minutiae of things. But then something happens that makes you question all of that. God strangely seems to have all his fingers in your pie, guiding and directing you in such small and subtle ways that it’s all quite mind blowing. I use the word “serendipity” to describe these moments. Sometimes things happen that are just too slick for any kind of explanation and I guess you’re just left with what was “meant to be”. Only the night before, I’d been discussing serendipity with a friend. Since I’ve sort exited the rat race due to my health issues, I’ve ended up in a spot where to some extent, I can let my life go with the flow a bit. I am a bit more flexible and can respond to changes of direction instead of being stuck on the old railroad track. I’ve had my plans but I’ve also been on some fabulous goat trails which have extended me so far beyond what I ever considered possible. This has included starting to learn the violin this year. Just for the sake of honesty and disclosure, I am a Christian but I’m not a ram it down your throat Christian. I experience a spiritual God who actively guides my life even when I’m focused on other things. I am a human, breathing miracle just like every other person on this planet. So often we miss what God is doing in our lives or don’t understand that suffering is necessary for growth and as much as we don’t like adversity, it is part of life. Ironically, without adversity, we do not build resilience and we lack backbone, inner fortitude and we fall apart at the first sign of trouble. Adversity is as essential to personal growth as air is for breathing. That doesn’t mean I like it but life is what it is. Anyway, yesterday morning my daughter was competing in her first physical culture (physie) competition down at Terrey Hills. She had to be there at 8.30 AM so we stayed at my parents’ place in Sydney the night before and we had a 6.30AM start. That’s incredibly early for a pair of night owls. Physie is a combination of march, dance and gymnastics set to music. The girls have to remember quite detailed routines and it strikes me as being very precise and disciplined. My daughter does it with her friends after school and our club has a fabulous sense of community and fun as well as encouraging the girls to apply and extend themselves. As I mentioned before, this was Amelia’s first competition and although we’d had a trial run the week before, it was still quite nerve-wracking as it is when you try something new. I usually chat to my friends during physie and miss the gist of what’s going on. Hence, I had to a buy the regulation leotard in a stressful, last-minute panic. I also remembered hearing something about the hair and curls and being being able to buy some kind of twisty doobywackers to do the job. Not being much of a hair person myself, I didn’t bother filing that thought along with a thousand and one erroneous pieces of paper which are floating around this place like lost swans. You know how it is. You just get completely overloaded!! In the end, her hair looked gorgeous in a straight ponytail and I thought I was Mighty Mum just because I’d managed to get a hair ribbon in a matching colour. I’m just trying to keep things simple, especially for our first competition. You can get dreadful performance anxiety as a mother. Not because you’re worried your kid is going to screw up. You just have this awful sinking feeling you’ve forgotten something and that you will be the weakest link. The performance part was almost an anti-climax. There was no big catastrophe. She remembered her routine. She didn’t get a place but she was happy with her pink participation medal. It was all over quite early and we had the rest of the day ahead of us. Now, any sensible “sick” person would have gone straight home to bed after all of that excitement but not this little black duck. 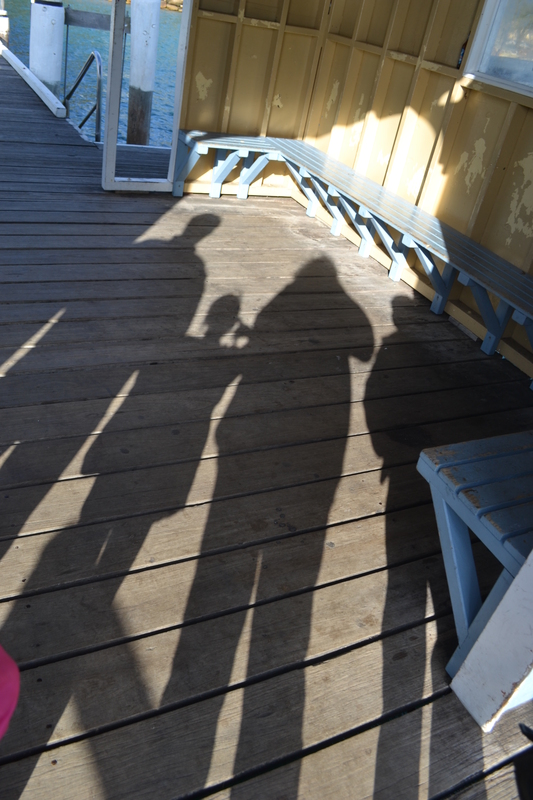 We were off to Whale Beach. I know this plan sounds somewhat insane given that I’m currently on 50mg a day of prednisone and my muscles are starting to waste away. Instead, you would think that I would have a nice, quiet day instead. But I am who I am. Carpe diem… seize the day. Tomorrow, I can crash. Besides, on this much prednisone, I’m like a Morris Minor with a V8 engine. I’m zooming along with all sorts of bits falling off. I’m probably about to combust. But I literally can’t stop!! This was the first time I have driven down to Sydney myself in at least 8 years. I can’t even remember the last time I’d driven down to Sydney myself. So there I was in Sydney with the car halfway to the Northern Beaches and a trip to Whale Beach made such perfect practical sense. I have only driven past the house once or twice since we sold it over ten years ago. That place was like my heart and soul being turned inside out and painted onto an enormous canvas. I desperately wanted to go back. See the house. Go and sit on my rock and absorb the waves. Share it all with my little girl! It would be so, so special! Recently, I had realised that Whale Beach has dropped out of our family narrative. We’ve moved on and I didn’t think the kids knew much about it at all. You can’t live in the past but I want them to know me. Experience me. Whale Beach has been such a significant chapter that I couldn’t leave it out. It’s still etched into my fingerprints, my heartbeat, my very being. So our adventure began. Driving up Mona Vale Road past the Baha’i Temple, I slipped back in time. I have driven up and down this road hundreds of times before and even though it’s been a very long time, I still know it like the back of my hand. I am going home. I am so excited but there is a little bit of caution too. What if they have knocked the place down? It’s been over ten years…a long time when you’re a 1960s shoebox shack with million dollar views. As I park opposite the old house, I notice some people outside and wonder if they’re connected with the house. I don’t know what I was really thinking at this point. I was just grateful the house was still there. When we first bought the place, it was painted primer pink and the cupboards were filled with all sorts of relics from the 1960s….old Women’s Weeklies, an old porcelain jug, empty Chianti bottles. There was even an ancient bottle of Detol. There were all sorts of funny bits and pieces tucked away all over the place and we kept them. They were fascinating. Mum and Dad had bought Whale Beach, well our little patch of it anyway, while I was still at uni. As a uni student, you really couldn’t ask for anything better. Unfortunately, I couldn’t drive at the time so there were grueling trips from Wynyard Station on the 190 bus and a hellish climb over the hill to reach paradise. Of course, there were parties. New Year’s Eve staying up all night at the beach by the campfire and watching the sunrise over the water…a new beginning. For some strange reason, I still believe that life starts over on January 1st each year. Silly me! There were also many, many hours of deep contemplative reflection, atomic angst and bust ups, broken hearts. The storms weren’t always over the sea. But ultimately, it was a place of healing. Sewing broken hearts back together. Writing, journaling, working through stuff as I watched the street light twist and turn like a snake shining across the waves down the southern end of the beach. Anyway, as I get out of the car, this young bloke calls out to me and asks if I could give him a jump start. From my point of view, he’s just asked me to perform open heart surgery on his vehicle. I can feel myself starting to panic a little. I really want to help but this is way out of my league. As anybody who knows me knows, I am not technical. I am certainly not mechanical and I’m really not practical either. The only thing I know about my car is that it’s blue and it has a luggage pod on top and that’s how I find it in the car park. I am also a reformed nervous driver. I have realised that I have serious spatial deficits and it’s all about parking and manoeuvring the car in tight situations that’s the problem …not the actual driving itself. This doesn’t help me with the jump starting. I will need to jiggle the car into position and this is looking very tricky indeed. Jump starting this car on windy narrow beach road presses all my alarm bells but I am feeling strangely confident. After all, I am on 50mg of prednisone and it really does make you feel like you can do just about anything. The bloke senses my hesitation and asks if I’m in a hurry and then asks what I’m doing there. Not in an interrogative way but it’s not the tourist end of town. I tell him that my Dad used to own the house across the road. He tells me that his Dad currently owns the house. Suddenly, we are no longer two strangers passing by daylight. There is this link. Suddenly, the seemingly impossible becomes a reality and I am suddenly standing inside my parents’ old beach house and he is taking a photo of my daughter and I standing on the balcony with all of Whale Beach stretching out behind us. I am in absolute heaven. I had never thought in my wildest dreams that this would ever happen but I can also hear my mother saying: “only you Rowena”. I am always meeting strangers and establishing strange coincidences. But we still haven’t jump started the car yet. Of all the people this poor guy had to ask for help, he must have picked the worst. Just turning the car around was a challenge and I no idea how to open the bonnet. I felt like such an idiot but we can’t be good at everything. I offer an emotional philosophical breakdown service. I’m not the NRMA but I came through. He got his car started and our paths deviated once again. I was on top of the world gushing with so much thought and emotion seeing the old place again but I still wanted to show Miss my rock down on the southern end of Whale Beach. The rock overlooks the surging waves and I just sit there watching them smash against the rocks exploding into a million million water droplets. The waves sound deep like there is some kind of underground cave. 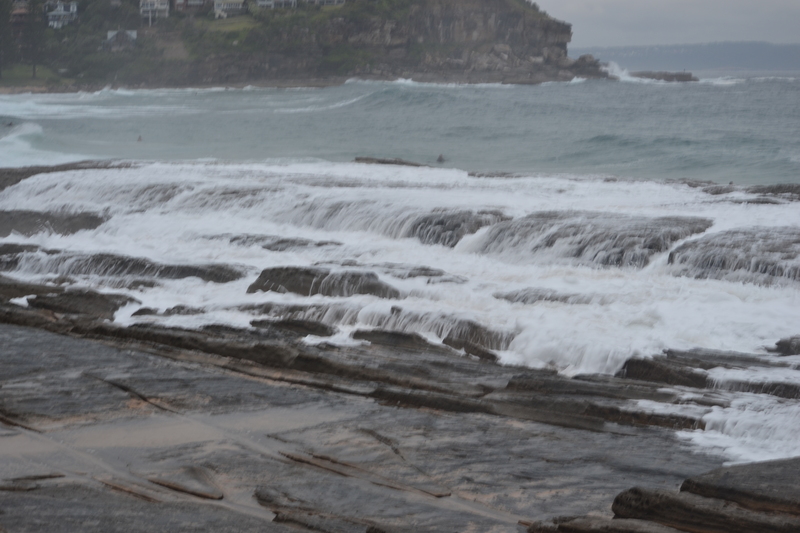 I am impressed by the sheer force and power of the waves…the energy. I can almost hear them breathing. Miss is collecting blue periwinkle shells and lining them up and watches the snails stick their tongues out below and wiggle their tails. She is mesmerised. She runs off with the video camera and starts filming her own documentary. She is wearing a black vinyl jacket and looks very much the film director…just gorgeous. I find some rock pools filled with squiggly snail trails. I remember photographing these many years ago and show them to Miss. I want to photograph her feet next to them. 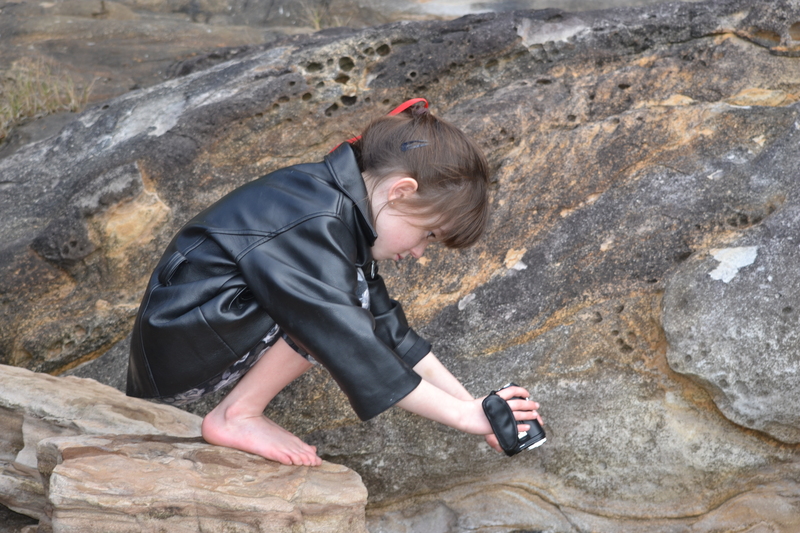 She tells me that “snails make the best drawers” and she films her feet while I take the photos. I can’t help looking at her and seeing a glimpse of my own reflection. She has told me before that I have stolen her hair and we look quite similar but she also sees the world through the lens and finds herself stranded on a rock surrounded by the waves with the video camera in hand. She is crying. I can’t reach her but a stranger comes to her rescue. She was never in any danger but at that moment, I knew she had the bug. She’d do anything for the shot!! Anything to get the shot. It was hard to leave Whale Beach but Geoff and our son were arriving on the Palm Beach Ferry. They’d been to football and were meeting up to go back to my parents’ place for my birthday party. This was my last day of being 42. If you have ever read the Hitchhikers Guide to the Galaxy, you will know that 42 is answer to the meaning of life, the universe and everything. This day kind of finished things up rather poignantly. I was satisfied…content. I could move forward. I am now wondering, now that the mystery has finally been unraveled, what I’m going to do with the rest of my life? This entry was posted in Parenting, Sydney Postcards, Travel, Uncategorized and tagged auto-immune disease, Christian, ferry, God, happiness, illness, inspiration, kids, meaning of life, meditation, mum, Palm Beach, parenting, photography, serendipity, Sydney, travel, Whale Beach on July 31, 2012 by Rowena.